The DreMak (pronounced Dream Make) Studios™ Store is a unique, state-of-the-art auditioning studio that produces high quality digital videos. Imagine going to your local mall and being able to privately audition for wide range of opportunities presented by members of the entertainment industry. DreMak is using its innovative technology to allow casting directors the opportunity to more easily connect with the performers they seek. After entering the fully automated interactive studio, the process begins by interacting with a touch screen control panel. As you begin, a casting director/producer appears in front of you on a 65' TV screen and explains the process that will take place. Using the touch screen to control the process - customized for each audition - you record your live, high quality audition video. At the completion of your audition, the studio will automatically upload your audition to the DreMak website where it can be viewed by the shows producers and/or rated by millions of internet users. You also walk away with customized DVD of your performance. The purpose of DreMak Studio is to provide a venue for customers to showcase their talents in a professional environment at an affordable price. 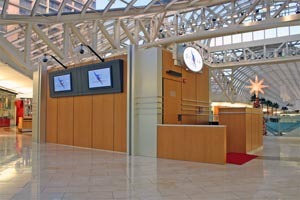 MacServe.net provided a full service consulting effort to bring the DreMak Studio from concept to retail reality at the Dallas Galleria. The full technology circle went from Point of Sale, to automation, to delivery of custom DVD and integration of videos into the dremak.com website. Planning, design and implementation of all booth operation/workflow concepts/adjustments. FileMaker Pro database programming and interface for both POS sytem and booth access, video recording and playback systems. AppleScript/serial port automation of programmable Camera angle mount. Touchscreen based user interface for booth control. Applescript automation of video processing system using Sorenson, Cleaner and Flash video codec systems. AppleScript automation of iDVD video/disc burning system. Two click system for producing customized DVD. Integration of Bravo™ Disc Publisher from Primera Technology. Automated processing for Flash video and thumbnail creation for web delivery. Automated upload of videos to dremak.com website and integration/user notification. Mac OS X Server with PHP/MySQL based website running on an Apple Xserve G4. During the Summer of 2007, DreMak had the opportunity to expand the utility of their system to host casting audtions for two new reality TV shows. A "My Fair Lady" style show, "Lady or a Tramp" and "Paradise Hotel 2". We adapted the technology to capture the scripted question and answer sessions and then provide these in a special protected section of the dremak.com website for the casting directors to view.